Do study results apply to all orphanages? See below for an excerpt from Children from Romanian orphanages. This highly detailed summary of the landmark Ames Study of children adopted from Romanian orphanages is available by sending this form, with your cheque, to: 220 Summerhill Rd., Southampton, Ont. N0H 2L0 Canada. <!- 1, cell 1 -> Please send me one copy of Children from Romanian Orphanages. <!- 1, cell 2 -> I enclose an $9 cheque to "Robin Hilborn". Price in Canada is Can$9. In the U.S., US$9. Elsewhere, US$12. Robin Hilborn is publisher of the Post-adoption Helper series. Children from Romanian Orphanages is also available (No. 1) through the Family Helper series. See the form at Family Helper, and choose the editions you'd like to order -- discount for four or more titles. Many of our children adopted from Romanian orphanages are doing very well, but a minority still have behaviour and attachment problems years after the adoption. That's the conclusion of adoption researcher Dr. Elinor Ames of Simon Fraser University in British Columbia. She says that the longer a child has stayed in an orphanage, the more severe the problems. Moreover, parents planning to adopt from an orphanage should carefully balance their resources--time, money, energy and outside support--against the possible demands of an orphanage child. 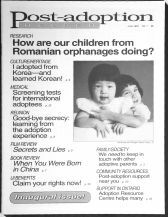 Her study of Romanian orphanage children is reported in detail in Post-adoption Helper magazine (from 220 Summerhill Rd., Southampton, Ont. N0H 2L0). Dr. Ames recommended that all internationally adopted children get a thorough medical checkup in Canada, following medical assessment guidelines such as those of the Manitoba College of Physicians and Surgeons. Those guidelines--screening tests and developmental assessment--also appear in Post-adoption Helper. From How are our children from Romanian orphanages doing? 1. All children from orphanages should be considered special needs children. They need extra parental time, energy, expertise and willingness to use outside help. 2. Because each month a child spends in an orphanage contributes to lower intellectual ability and more behaviour problems, the youngest children should be placed first when possible. Parents must realize that raising older children will call for extra commitment and resources. Parenting will not be easier because the child is past infancy. 3. Agencies should provide special pre-adoption preparation for parents, stressing the distinctive problems of orphanage children, especially those who have spent a long time there. The time and energy needed to raise such a child make it unwise to adopt more than one at a time, or to bring the child into a family with several young children. A pre-adoption program should help both parents decide if they have the resources to raise an orphanage child. 4. All internationally adopted children should get a thorough medical checkup in Canada, following medical assessment guidelines such as those of the Manitoba College of Physicians and Surgeons. Parents should have a brochure on suggested medical tests to show their doctor, like that of the Adoptive Parents Association of B.C. 5. All children adopted from orphanages should enter special infant development programs (or special preschool programs for older children) which include parent participation. 6. Agencies should give post-adoption support to parents of orphanage children. A program should cover: parent-child attachment; teaching social behaviour; dealing with attention-demanding behaviour, distractibility, hyperactivity and indiscriminate friendliness. Counsellors in these areas should be available. Community resources should be identified, e.g. parenting courses, speech therapy, special education. Access to support groups for parents of children from orphanages is especially important. Because of their children's distinctive problems, parents may not feel comfortable in a group of parents who adopted domestically. 7. More research is needed on adoptees from orphanages in other countries, to investigate changes at orphanages which would improve the prospects for orphans. Research on orphanages in different places and times has been remarkably consistent in showing similar adverse effects of orphanage rearing. We need to study how long these effects last. We need to find which factors of orphanage life are most damaging and could be remediated.